"This is one of my 'go to' recipes when pressed for time on a busy weekend. For a richer mushroom taste, use roasted cream of mushroom soup." Spread about half the onion slices into the bottom of the slow cooker. 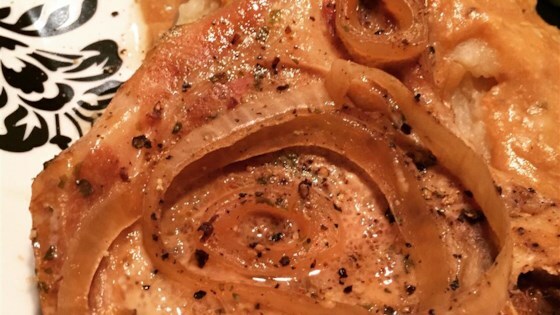 Arrange 5 pork chops atop the onion layer. Repeat layering with remaining onion and pork chops. Pour cream of onion soup, cream of mushroom soup, and water over the pork chops and onion. Sprinkle ranch dressing mix and onion soup mix over the pork chops; season with salt and pepper. Cook on High until the pork chops are tender to your liking, 2 1/2 to 3 hours. Alternately, you can cook on Low for 4 1/2 to 5 hours. An instant-read thermometer inserted into the center should read at least 145 degrees F (63 degrees C).